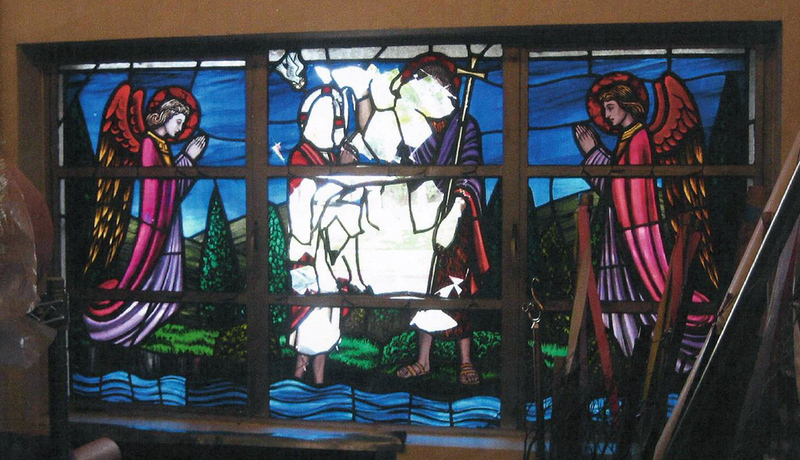 Restored center sections of Baptism of Jesus window ready for reinstallation, July 2014. 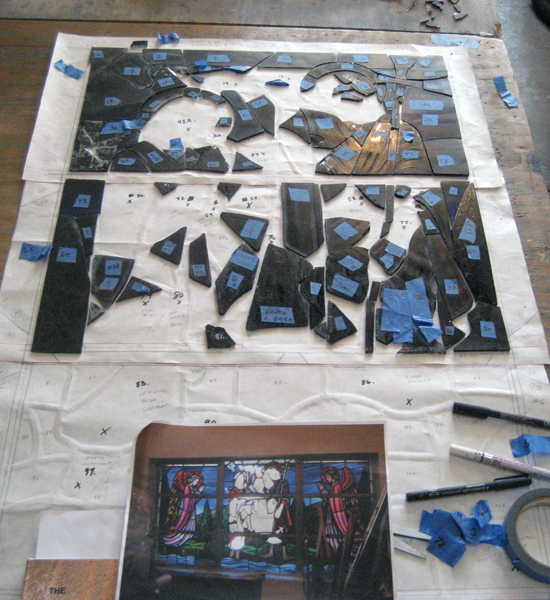 The glass is laid out on the workbench in order to recreate the design and identify replacement pieces, April 2014. 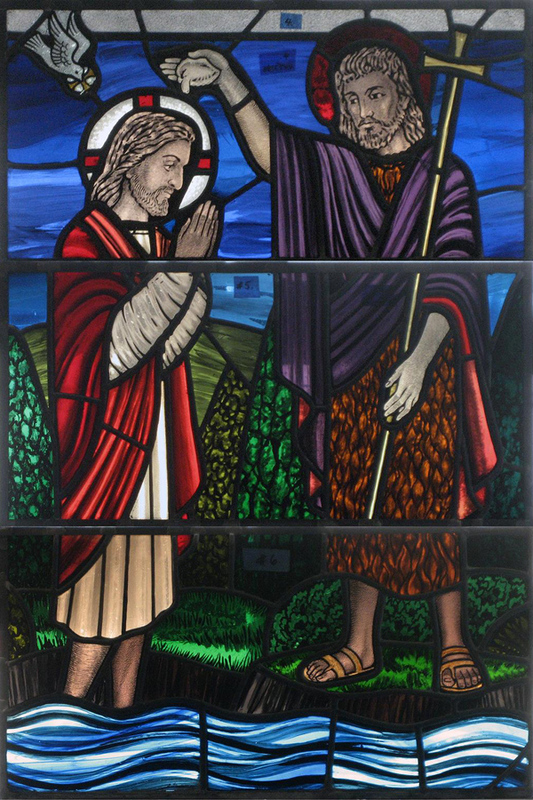 In early January of 2014, Ancient Arts Stained Glass (www.ancientartsstainedglass.com) owner Mark Schoem received a call from Deacon Dennis Carlson of Holy Trinity Church (www.HolyTrinitySP.org). One of the church's precious stained glass windows, a depiction of the Baptism of Jesus by John the Baptist, had been severely damaged by a vandal overnight (en.wikipedia.org/wiki/Baptism_of_Jesus). A contract was proposed, the church made arrangements with its insurance carrier and all 9 sections, each about 22" x 11," were removed in February. The opening was boarded up. This stained glass window had been in a room that had been used for several years as the environmental room. Items used for special occasions on the church calendar were stored in this room such as special decorations and garments. The room was kept locked and the precious window was unavailable for viewing. Deacon Carlson identified another window in the north vestibule of the church which did not have stained glass. This window had the same configuration and the same size and so it was decided to relocate the stained glass to this location after the restoration was completed. The stained glass windows of Holy Trinity were created by Harry Clarke Studios of Dublin, Ireland (en.wikipedia.org/wiki/Harry_Clarke) about 1959. The studio was very famous for its founder Harry Clarke, a great artist and stained glass master who died in 1931. The Harry Clarke and Harry Clarke Studios stained glass windows are well known for their rich detail, brilliant and masterful color combinations and their impeccable artistic merit. A great many churches all over the United States imported their stained glass windows from Harry Clarke. The great challenge for Ancient Arts stained glass studio was to replace 45 broken and missing pieces as closely as possible to the original intentions of the artist using 14 different colors of replacement glass. Fortunately, Holy Trinity had a commemorative book containing a good photograph of the Baptism window. This book was provided to our studio by Deacon Carlson and it was an excellent aid in our work. After a great deal of meticulous color matching and recreation of the original design the window was reinstalled on July 19th, 2014. After the project was completed Deacon Carlson told us that our work was beautiful. He said that "the craftsmanship in being able to make the window look like new is truly remarkable and truly a gift." 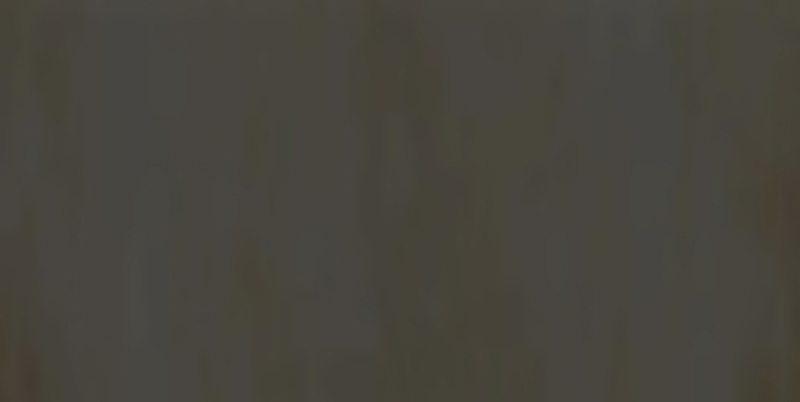 These kind words make all of our efforts worthwhile. We extend our wish that all the people of the Holy Trinity community will enjoy the Baptism window for many, many years to come. Vandalized stained glass window at Holy Trinity Church, San Pedro, CA, January, 2014.